It’s hard for the general public to play the crown jewels of one of America’s Golden Age architects. Most people - even golf fanatics - aren’t going to Alister MacKenzie's Cypress Point, C.B. Macdonald's National Golf Links of America, A.W. Tillinghast's Winged Foot or William Flynn's Shinnecock Hills. There is, however, one accessible, brilliant, fun, public option any golfer can go play for less than $100: Lawsonia Links in Green Lake, Wisconsin. Lawsonia Links is the masterwork of architects William Langford and Theodore Moreau. The Chicago pair made their hay in the midwest during late 20's and early 30's. Their bold style is unmatched and unmistakable. They built jaw dropping architectural features that pushed the limit of boldness thanks to their mastery of the steamshovel. 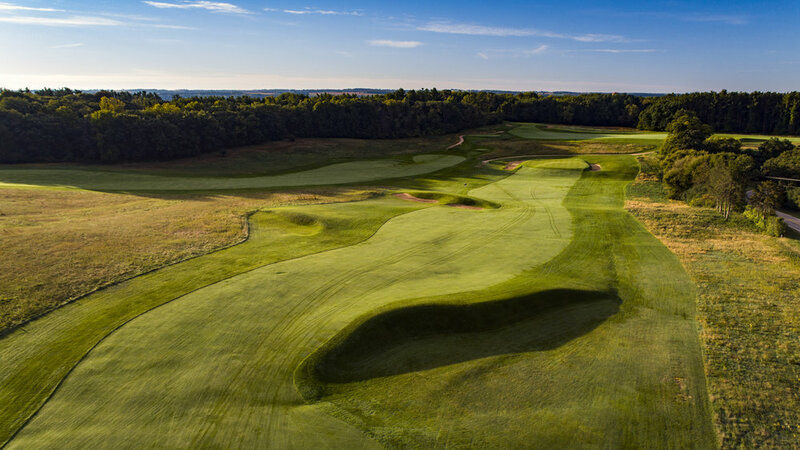 Along with their engineering mastery, they had a firm grasp of strategy and used width and their bold features to create lines of charm on intoxicatingly fun golf holes. 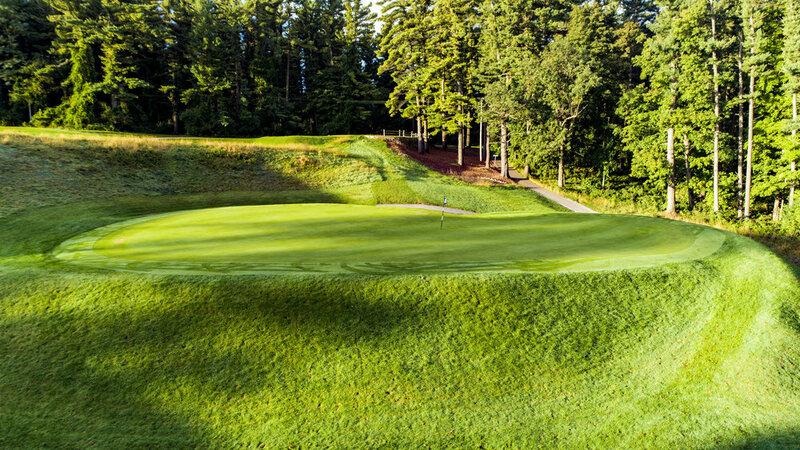 The Links course at Lawsonia embodies Langford and Moreau's design ethos. The Links course debuted in 1930 and is one of the greatest courses in the country that still flies under the radar. 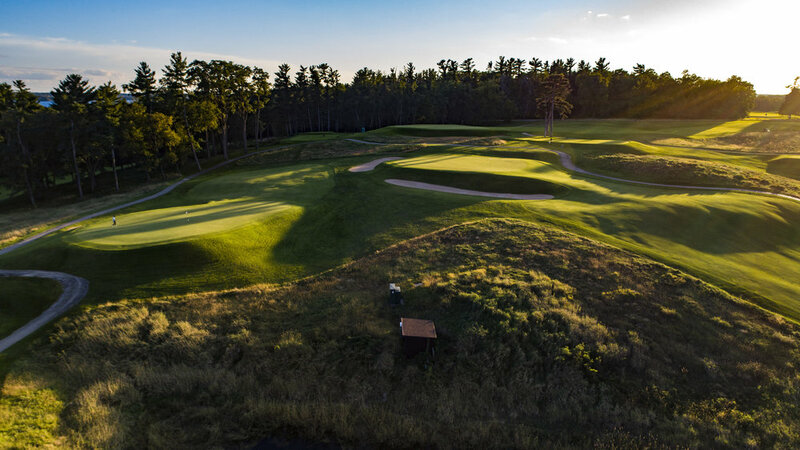 It is overshadowed by its high profile resort neighbors Sand Valley, Erin Hills and Whistling Straits/Blackwolf Run, and private heavyweights Milwaukee C.C. and Blue Mound. 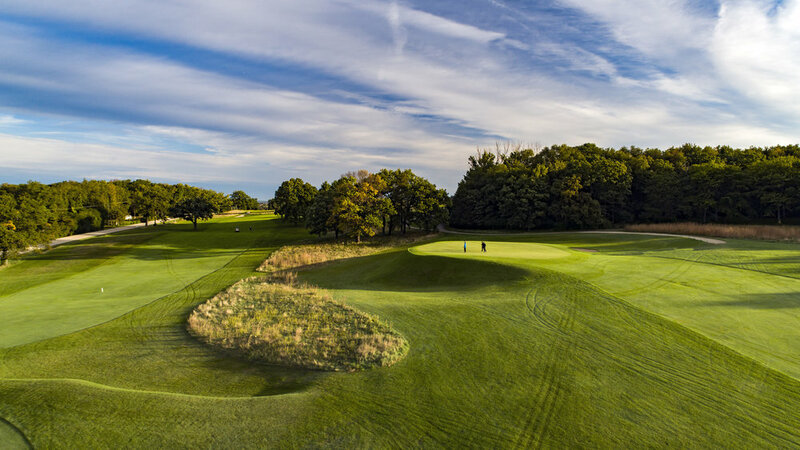 In spite of its lower profile, Lawsonia's Links Course belongs in the discussion of best in the state, and is unequivocally, the best value in the Midwest. Every day of the week, golfers are met with a twilight rate that's under $50 and the most a walker will ever pay is $95. That is value as mind-blowing as the features that Langford & Moreau built. It doesn't take long for golfer's to meet Langford and Moreau's distinct style. The par four first doglegs right, and features a massive diagonal fairway bunker. The left side of the first green falls off a man-made cliff. 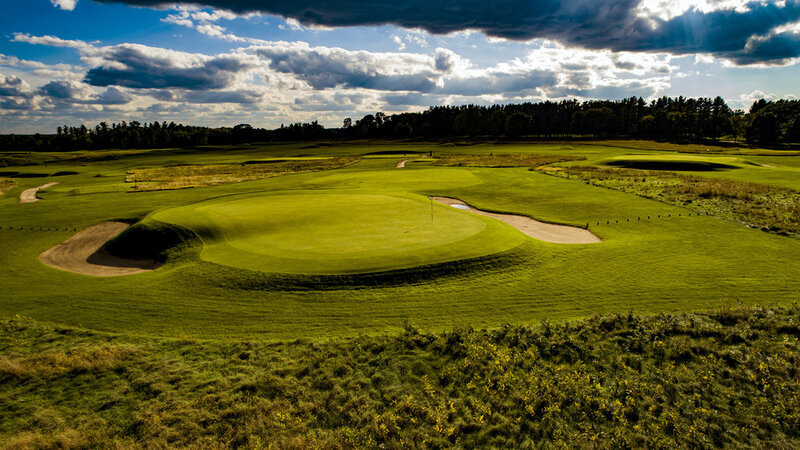 The front nine weaves through an oblong property and has its fair share of dramatic reveals. 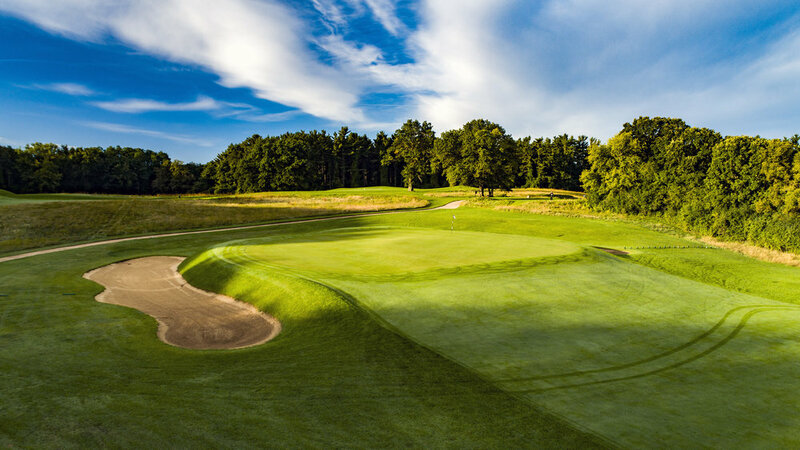 Standout holes include the long par-4 sixth with its upper-front, lower-back tiers, and the short par-3 7th which has a boxcar buried under the green. The opening nine closes out with the uphill brute par-5 9th before making the turn. The back nine at Lawsonia Links is one of the finest nines in all of golf. Set in a large rectangular field, its main feature is a large ridgeline that runs through the southern portion of the parcel. The architects were able to maximize this small area perching the 10th, 13th and 14th greens on top of the ridge. The routing sets up thrilling tee shots and dramatic approaches into the greens. The standouts on the back nine are the par-5s and 3s. The ridge where the 14th (left), 13th (center) and 10th (right) greens rest. 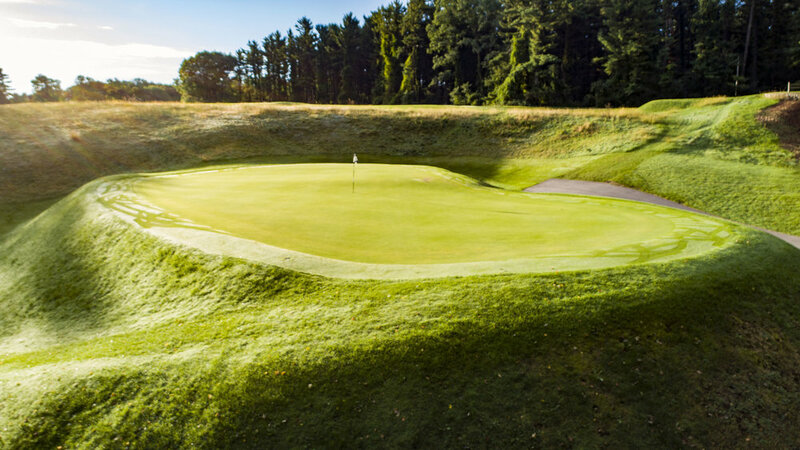 The 11th, 13th and 18th provide opportunities to reach in two depending on the wind, but require strategic positioning to find the proper section of the green in order to score. The 10th, 12th and 14th are a varied set of par-3s that test player's long irons (10), mid-irons (12) and wedge game (14) with deep bunkering and vexing internal green contours. On both nines, Langford & Moreau routed the course masterfully to take maximum advantage of land movement, while introducing variety through consistent changes of direction. The features they created look both highly engineered and perfectly suited to the surroundings. The perfect balance is struck. The Links Course also serves as an example of the profound effects of tree removal. When Craig Haltam and Oliphant Golf took over the property in 2010 the Links Course was a shell of itself. The course had been overgrown with trees, had the edges of its massive greens complexes buried in rough, with turf conditions leaving much to be desired. Thanks to an efficient and well-thought out long-term plan, Lawsonia continues to get better every year. 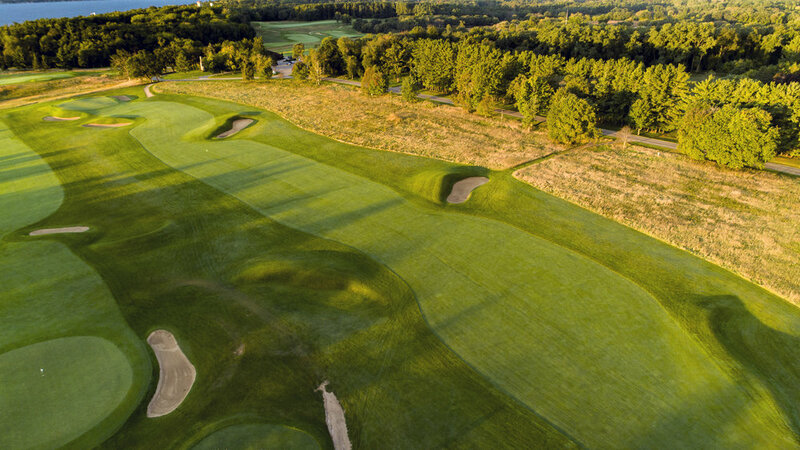 A golfer with a remote interest in golf course architecture should move Lawsonia Links to the top of their must-see list. Once you see and play Lawsonia, you will never be the same again.